Auditions for lead roles and ensemble for the Repertory Philippines Theater for Young Audiences (RPTYA) Production of PINOCCHIO will be held on March 30 and April 6, 2014 at 6:00 pm at the Onstage Theater Greenbelt One. Applicants will be tested for voice, musicality, the ability to pick up notes quickly and skill at parts singing, acting, and movement. (The ability to speak English is a requirement for all lead roles). Application forms and audition material may be picked up at the REP office at Unit 14 Ecoville Executive Town Homes, Metropolitan Avenue, Brgy. Sta. Cruz, Makati City (please bring your own flash drive). You may also email olison14@yahoo.com. For information call 8433570 or 4511474. Ask for Oliver or Marie. 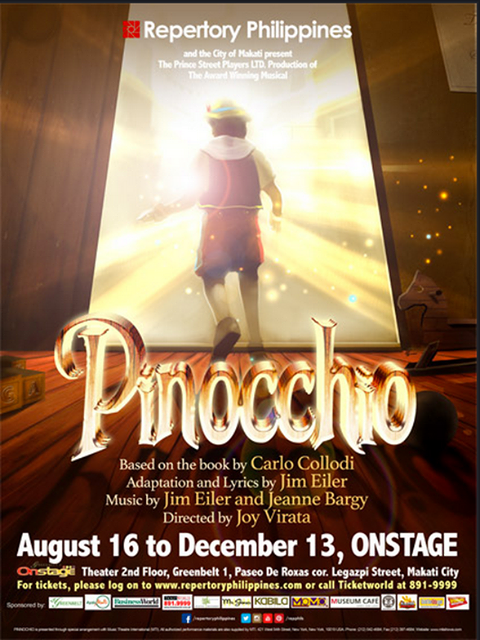 PINOCCHIO will open on August 16 and run on weekdays and weekends - mornings and afternoons - until December. It will have three alternating casts. Rehearsals will be from 6:00 to 8:00 Monday to Friday.